Johnny Morant (b.1982) Working in oil on canvas I aim to readdress familiar subject matter by applying a process that demands fresh interpretation. I set constraints that give me the freedom to create information that my source material lacks. In doing so I aim to give a fresh cause for consideration through permanence, scale and decision making. I attended art school in Bristol and Bournemouth before moving to London and more recently Amsterdam. Asked to sum up my last exhibition I explained that "by playing on the border between clarity and suggestion my work prioritises the intuitive application of paint and aims to capture the viscosity of light and insecurity of form." This still rings true while my main motivation to create now relies on reinvigorating restrained subject matter through interpretation and expression. 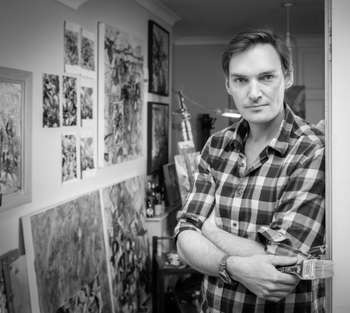 I have had three solo exhibitions in London SW1 at the Rountree Tryon Gallery and have work included in a growing number of collections including Smith & Williamson, Standard Chartered Bank, Prudential plc and Old Mutual plc.